How Long Have We Really Been ‘One Nation Under God’? Kevin Kruse’s new book explores how “Christian America” was invented to fight FDR’s New Deal. 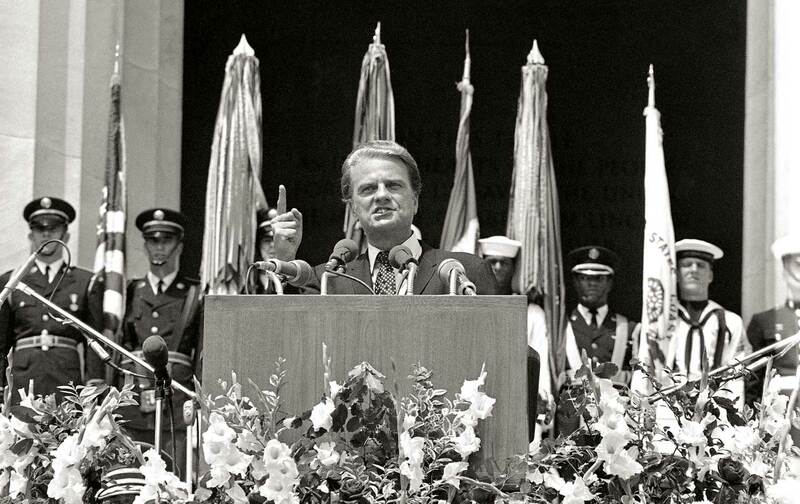 Billy Graham speaks from the steps of the Lincoln Memorial on Honor America Day, July 4, 1970. How Corporate America Invented Christian America. Did this blend of religious revival and political rally reflect long-standing American traditions? Or was it a cultural invention of the Cold War era and the conservative backlash against the 1960s? In One Nation Under God, Kevin Kruse argues that it was neither. To understand the presidential pageantry of 1969—and just what Billy Graham meant when he invoked this “nation under God”—Kruse says we must turn back the clock to the 1930s. There is no shortage of books on American versions of “civil religion,” a term that Jean-Jacques Rousseau coined to describe the “social sentiments without which a man cannot be a good citizen or a faithful subject.” Rousseau invoked not a specific set of doctrines, but a general faith in God and eternal punishment and reward. A wise sovereign should banish anyone who fails to assent, “not for impiety, but as an anti-social being,” he wrote. In 1967, the sociologist Robert Bellah wrote that in the United States, civil religion denotes “a collection of beliefs, symbols, and rituals with respect to sacred things” that have been institutionalized in American culture since the country’s origins. It is more capacious than Christianity, yet still more concrete than “religion in general,” rooting political rights in divine decree rather than human authority. Scholars have been grappling with the contents and implications of that civil religion ever since. Kruse is not very interested in this long-running debate about the broad sweep of American history. “Civil religion” is his subject, but oddly the term itself appears only twice in the book. Instead, he tells a story focused tightly on a campaign by a small number of businessmen and sympathetic pastors, politicians, and culture-makers who gilded their vision of laissez-faire capitalism with pseudo-Christian pieties in order to induce Americans to reject the temptations of the welfare state. Their campaign helped spawn a reformation of the country’s political rituals and gave rise to a new set of American “traditions,” which conservative elites and grassroots leaders used to push back against progressivism. One Nation Under God is a close study of postwar political liturgy. Most of the stories that Kruse tells are broadly familiar: the addition of the phrase “under God” to the Pledge of Allegiance in 1954; the official adoption of the motto “In God we trust” on all American currency in the late 1950s; the Supreme Court decisions that struck down state-mandated prayer and Bible reading in public schools in the early 1960s. But Kruse combs over these events with far greater attention to detail than most other scholars have done, and even a specialist reader will learn something new. More important, he weaves together these episodes to explain how a string of simple words or rote classroom recitations—what the legal scholar Eugene Rostow once dismissed as “ceremonial deism”—can have great cultural power. In the end, Kruse exaggerates the chasm between the political culture of postwar America and the civil religion of prior eras. Even so, his book is an illuminating addition to the growing field of the history of American conservatism and capitalism, as well as a vibrant study of the way cultural influence works—one that will make it impossible to take for granted the small print on the back of a dollar bill ever again. “Our form of government has no sense unless it is founded in a deeply-felt religious faith, and I don’t care what it is.” Scholars seem to quote this sentence more often than anything else that Dwight Eisenhower said in his long military and political career. They often cast him as spiritually indifferent, a president committed to standing strong against the godless Soviets but too pragmatic to be bothered with the details of theology (he wasn’t even baptized until he reached the White House, when his neglect of the rite began to appear unseemly). Yet Kruse reminds us that Eisenhower was steeped in serious Christian faith from childhood. His mother named him after the great evangelist Dwight L. Moody. As an adult, Eisenhower rarely went to church, but he “could quote Scripture by the yard,” according to one of his wartime aides. He retained a fundamental respect for all biblical religions and their affirmation of “the ‘spiritual ideals’ and ‘moral values’ of the American Way of Life,” wrote the sociologist Will Herberg. What, precisely, was that “Way of Life”? Big-business conservatives had their own ideas, and hoped that Eisenhower’s election represented the culmination of many years spent trying to convince the American public that their way of life was under threat. Kruse suggests that the roots of the conservative political ideology of the 1950s reach back a generation earlier, when America’s business leaders had little time to worry about fighting communism abroad because collectivism masked as Christianity lurked at home. Franklin Roosevelt had sold his New Deal to voters in part by explaining economic justice in terms of the Social Gospel, a progressive interpretation of Christian doctrine that casts sin not just as personal depravity, but as a cultural and institutional evil that demands a united effort to reform social structures and bring about the Kingdom of God. Throughout the 1940s, Fifield and his collaborators honed their message to persuade a wide range of Protestant, Catholic, and Jewish clergy that leaders of “Judeo-Christianity” ought to fear the welfare state as much as corporate capitalists did. Fifield recruited more than 12,000 clergymen to serve as Spiritual Mobilization’s “representatives.” They circulated libertarian pamphlets among their congregations and drew upon Spiritual Mobilization’s literature to craft their sermons. A monthly magazine called Faith and Freedom and syndicated radio broadcasts spread the message even more widely; by 1951, the latter had aired on more than 800 stations. Spiritual Mobilization’s efforts culminated that Fourth of July with a series of media spectacles united by the theme “Freedom Under God,” including full-page newspaper ads asking: “How many ‘Independence Days’ have we left?” A national radio broadcast featured Jimmy Stewart and Bing Crosby—not to mention an epic poem entitled “Heritage,” written by a former head of the US Chamber of Commerce. Kruse argues that this propaganda machine laid the groundwork for the efflorescence of American civil religion after World War II and endowed all the God talk with a particular socioeconomic agenda. By the 1950s, when Billy Graham was bellowing against trade unions and communism in his massive crusades, the Methodist minister Abraham Vereide had corralled politicians into state and national prayer breakfasts, and Eisenhower averred his podium pieties, Americans were primed to embrace the fusion of Judeo-Christianity and US capitalism. Adding “under God” to the pledge and formally adopting “In God we trust” as the nation’s motto seemed not like innovations, but common-sense affirmations of the country’s long-standing tradition—one that conservatives feared was in peril. When DeMille learned that the Fraternal Order of Eagles was distributing modest plaques of the Ten Commandments for display at state and local government buildings and public parks, he offered the help of his publicity department and urged the Eagles to think bigger. Why post simple paper scrolls when you could install an imposing stone monument? DeMille, who had recently visited Mount Sinai on a religious pilgrimage, sent a sample of granite he had carved from the site so that the Eagles might match the color. When it came time to dedicate a monument, Ten Commandments stars Yul Brynner (who played the pharaoh) and Charlton Heston (Moses, and a member of Fifield’s church) occasionally appeared: a master stroke for film publicity and for DeMille’s vision of American civil religion. The great virtue of One Nation Under God is Kruse’s detailed account of media pageants like these: the decades-long, multifaceted cultural crusade of national radio broadcasts, newspaper ads, urban rallies, and Hollywood celebrity testimony that formed the backdrop against which the better-known events of the early culture wars unfolded. He captures a lost moment when postwar mass consumerism was near its peak—just before the atomization that would come with the rise of advertising’s more sophisticated market segmentation. National ad campaigns and culture-makers like DeMille had wider and more powerful influence than they ever had before, or ever would again. Yet Kruse never quite proves the grand claim of his subtitle: that “corporate America invented Christian America.” It didn’t. Strategic advertisements and Hollywood hits may have stirred some Americans’ sentiments and stoked their conviction that God had anointed capitalist Christians to win the Cold War abroad and control the culture at home. But the roots of this Christian libertarianism are far older than the disgruntled plotting and deep pockets of anti–New Deal industrialists. The story that Kruse tells builds on at least 50 years of historical scholarship tracing the development of civil religion in North America since colonial times, and which demonstrates that “under God-consciousness” and Christian libertarianism have always been a feature of American ideology. The business leaders of the 1930s and ’40s had a new enemy in mind—FDR and the emerging welfare state—and new technologies and methods by which to advance their vision, but the outlines of their basic project reflected a long American tradition. In his introduction, Kruse alludes only briefly to this earlier history: “Like most scholars, I believe the historical record is fairly clear about the founding generation’s preference for what Thomas Jefferson memorably described as a wall of separation between church and state,” he writes. His characterization of the scholarly consensus is perplexing, because most historians emphasize the variety of opinion among the politicians of the early Republic on the relationship between government and religion. Jefferson spoke for few people other than himself and James Madison, and “the U.S. Constitution and the First Amendment did not create the separation that Madison and Jefferson advocated,” historian David Sehat has written. In 1833, Supreme Court Chief Justice John Marshall ruled that the Bill of Rights did not apply to states, leaving plenty of room for blasphemy laws, religious tests for office, and state constitutions like New Hampshire’s, which declared “evangelical principles” as the basis for “morality and piety”—what Sehat calls a “Protestant moral establishment” that the Court did not begin to dismantle until the 1920s. Kruse notes that the presidential bromide “God bless America” became standard speechifying fare only with the rise of Ronald Reagan. Perhaps Reagan did popularize that particular civil-religious formula, but Robert Bellah pointed out long ago that God has appeared in every presidential inaugural address throughout American history (except for Washington’s second). Even the infidel Thomas Jefferson proclaimed that “I shall need, too, the favor of that Being in whose hands we are, who led our forefathers, as Israel of old, from their native land and planted them in a country flowing with all the necessaries and comforts of life.” And the motto “In God we trust”? It was not an invention of the 1950s: Those words have appeared on many—if not all—US coins since 1864. Does this ancient history matter to our understanding of late-20th-century America? Kruse says that he “sets aside the question of whether the founders intended America to be a Christian nation and instead asks why so many contemporary Americans came to believe that this country has been and always should be a Christian nation.” The trouble is that the “Christian libertarianism” he claims to discover in the backlash against the New Deal is at least as old as the Revolution. In the 1770s, preachers like the Baptist Isaac Backus called on Christians to rise up in violent resistance against the king. They fused the tenets of evangelical Christianity with a fierce anti-statism (unless, of course, they could harness the state to advance their own moral vision—like all ideologies, Christian libertarianism has always proved somewhat malleable). When the founders crafted the checks and balances that form the cornerstones of American government, they institutionalized this deep suspicion of central authority and lopped off a significant chunk of the English political tradition: the vision of centralized state power that would animate both the Tory right and the socialist left. If you’re skeptical that 18th-century politics could possibly have much to do with the unique role of conservative Christianity in handicapping the American welfare state, a quick comparison to our nonrevolutionary northern neighbor is instructive. In Canada, the Social Gospel flourished in mainstream 20th-century politics, and a Baptist minister turned socialist politician named Tommy Douglas led the way in founding single-payer healthcare. In Kruse’s account, “under God-consciousness” became a divisive force in postwar America, an arsenal of cultural weapons that conservatives deployed against hippies and civil-rights activists (even if it failed to compel either Eisenhower or Nixon to dismantle the welfare state). But with no reference to civil religion’s longer history, we miss the fact that the intersection of religion and politics has always been the site of culture war: between Protestants and Catholics; 19th-century capitalists and progressive reformers; Northerners and Southerners; whites and blacks. All have had their own civil religions, their own forms of God-drunk patriotism, ranging from the Southern white supremacist’s cult of the “Lost Cause” to the African-American’s faith in a long and steady exodus to the Promised Land. The culture wars that have racked American politics since the 1960s are the most recent chapter in this longer history. During the Great Depression and the postwar era, anti–New Dealers sharpened and revised America’s long tradition of Christian libertarianism, while activists on both the right and the left adapted old civil-religious tropes for their own purposes. This is what’s most interesting in the story Kruse is telling: the pattern of continuity and change that links our own time with those that came before. Molly WorthenMolly Worthen, who teaches North American history at the University of North Carolina, is the author of Apostles of Reason: The Crisis of Authority in American Evangelicalism.